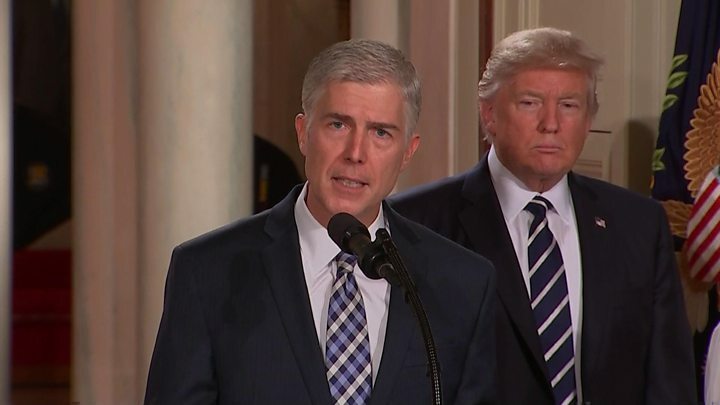 President Donald Trump has nominated Colorado federal appeals court judge Neil Gorsuch for the US Supreme Court. If confirmed by the Senate, the 49-year-old would restore the court's conservative majority, lost with the death of Justice Antonin Scalia. The Senate Democratic leader has said he has "very serious doubts" about Judge Gorsuch's nomination. The court has the final legal word on many of the most sensitive US issues, from abortion to gender to gun control. 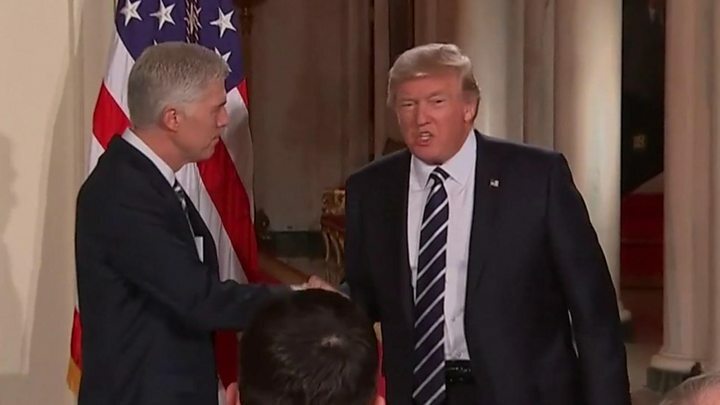 Media captionJudge Gorsuch spoke of his "most solemn assignment"
Mr Trump said Judge Gorsuch had a "superb intellect, an unparalleled legal education, and a commitment to interpreting the Constitution according to text". "Judge Gorsuch has outstanding legal skills, a brilliant mind, tremendous discipline, and has earned bipartisan support," Mr Trump said. He was picked from a shortlist of 21 choices, which Mr Trump made public during the election campaign. Accepting the nomination, he said: "It is the role of judges to apply, not alter, the work of the people's representatives. A judge who likes every outcome he reaches is very likely a bad judge, stretching for results he prefers rather than those the law demands." Media captionThe Supreme Court has been without a full bench for almost a full year. Judge Gorsuch is a so-called originalist, meaning he believes the US Constitution should be followed as the Founding Fathers intended. If successful, his nomination will restore the 5-4 conservative majority on the nine-seat high court. Protests against Mr Trump's choice were held outside the Supreme Court following the announcement. Who are the current eight justices? 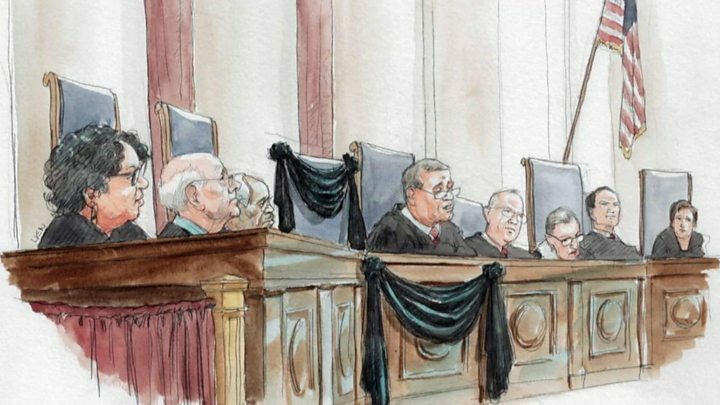 Why is the Supreme Court so important? Where does Judge Gorsuch stand on key issues? Abortion: He has not spoken out about Roe v Wade, the case which legalised abortion nationwide in 1973, making in difficult to pin down where he stands on the issue. Birth control: Judge Gorsuch has supported religious institutions which objected to requirements for employers to provide access to contraception. In one of his most high-profile cases, he defended the religious owners of retailer Hobby Lobby who refused to fund birth control via staff health insurance. Gun rights: He hasn't ruled directly on firearms restrictions, but is thought to be generally pro-second amendment. He once wrote in a legal opinion that a citizen's right to bear arms "must not be infringed lightly". Euthanasia: He has been vocal about assisted dying, writing a book in 2009 which opposed legalisation. Donald Trump's choice of Neil Gorsuch as his Supreme Court nominee is a fairly traditional pick in a decidedly untraditional time. Judge Gorsuch has a CV and background that would make him a natural selection for just about any Republican president. He's the kind of Supreme Court nominee evangelical and traditional conservative voters dreamed of as a reward for sticking with Mr Trump through the general election despite campaign missteps, controversies and occasional political apostasies. They knew they would get a court pick they wouldn't like if Hillary Clinton won. They hoped they would get someone like Judge Gorsuch if Mr Trump prevailed. Meanwhile, Democrats are left fuming over Senate Republicans' precedent-breaking decision to stymie Barack Obama's attempts to fill this court vacancy for nearly 10 months. They have to decide if they will try to derail Mr Gorsuch's nomination as retribution - perhaps forcing Republicans to break with another Senate tradition, the ability of a minority to a block a Supreme Court nominee with only 41 votes through a filibuster. The party's base, feeling a liberal majority on the court was stolen from them, will demand lockstep resistance, likely setting up a divisive confirmation fight ahead. Can Democrats block the nomination? Judge Gorsuch's nomination is expected to spark a political showdown in the Senate. Former President Barack Obama had put forward Judge Merrick Garland after Justice Scalia's death last February. But Republicans refused to debate the choice, saying it was too close to an election, which left Democrats embittered. Even if Judge Gorsuch makes it through the Senate Judiciary Committee, he will still face challenges when the entire chamber convenes for a final vote. Democrats may seek to prevent that second vote by prolonging or filibustering the debate. In that case, the nomination would need 60 votes rather than a simple majority. With Republicans only holding 52 Senate seats, they may have to change Senate rules in order to approve Mr Trump's nominee. The highest court in the US is often the ultimate arbiter on highly contentious laws, disputes between states and the federal government, and final appeals to stay executions. It hears fewer than 100 cases a year and the key announcements are made in June. Each of the nine justices serves a lifetime appointment after being nominated by the president and approved by the Senate. The court already has cases this term on the rights of transgender students, gerrymandered voting districts and on the Texas death penalty determination. It is also likely the court will hear cases on voter rights, abortion, racial bias in policing and US immigration policy, and possibly on Mr Trump's controversial executive order banning refugees. The US Army Corps of Engineers was ordered to approve work on the controversial Dakota Access oil pipeline, a week after President Trump gave it his blessing.